Greenwood’s Kirby Elizabeth Self, 18, said she is still trying to catch her breath after being crowned Miss South Carolina Teen USA 2018. The November competition was in North Charleston at the North Charleston Performing Arts Center and is the official state preliminary to the Miss Teen USA pageant. That same weekend at the same location, the 2018 Miss South Carolina USA pageant was conducted, a preliminary for the Miss USA competition. Both pageants had representation from the Lakelands. 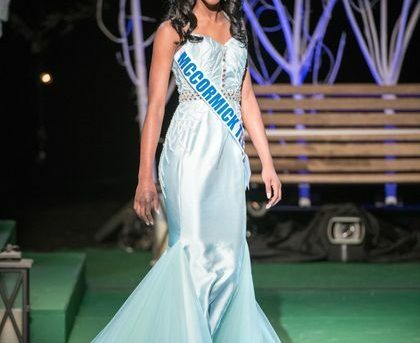 Ivory Baylor of Greenwood, representing McCormick in Miss SC Teen USA. Siblings Scarlett Manley and Charley Manley, both of Greenwood. Scarlett Manley represented Mountain Lakes in Miss SC Teen USA and Charley Manley represented Greenwood in the 2018 Miss South Carolina USA pageant. Mae-Ann Webb of Ridge Spring, represented Lexington in Miss SC South Carolina USA. In the teen division, Greenwood’s Charley Manley was named third runner-up. In the miss division, Mae-Ann Webb, representing Lexington was fourth runner-up. Contestants were judged equally in categories of fitness, interview and evening gown. Self, who competed at the state level representing the Upstate, goes on to represent South Carolina in the Miss Teen USA competition during the summer of 2018. Self told the Index-Journal that she didn’t compete in her first pageant until a student at Emerald High School. Self, a Clemson University freshman and former high school track and field standout, said learning to walk in heels was tough. Entering pageants initially, she said, was a “step out” of her comfort zone. Self is a state champion in the 400-meter hurdles and two-time state champion in triple jump. Self says said scholarship pageants are much more than skin deep. She has twice received the Presidential Volunteer Service Award, the Better Business Bureau’s Student of Integrity Award and the Young Entrepreneurs Award. A political science major double minoring in communications and nonprofit leadership, Self said she aspires to obtain a law degree and continue working with nonprofits. She is on the Clemson University water ski team and participates in women’s chorus. To that end, Self said she enjoys working with people with mental and physical disabilities and promoting youth leadership through volunteerism. Self said she has a passion for working with the disabled and mentoring youth. Last year, Self said she had the opportunity to share the Miss South Carolina Teen USA stage with the organization’s first physically disabled contestant, Nila Morton, who uses a wheelchair for mobility. “I knew right away this organization was the right place for me,” Self wrote the Index-Journal, via email. Self said it is rewarding when young women entering their first pageants contact her for advice and help. She has worked with young women from a variety of backgrounds, who have competed in area pageants at the high school level and beyond. Among those she has worked with is Ivory Baylor, who competed in Miss SC Teen USA, representing McCormick. “She is an Emerald City Elite track and field teammate,” Self said. Baylor, 16, is a sophomore at Greenwood High School and Miss SC Teen USA was her first larger-scale pageant. In September 2016, Baylor said she sustained burns from a grease fire while she was cooking. She spent time at the Augusta Burn Center. Baylor was named Miss Freshman at GHS in 2016.